From their flat on the 21st floor of London’s iconic Balfron Tower, 47Soul had a clear view of the city’s great power divide. The neighborhood is historically among the poorest in London. Their neighbors in the building — a Brutalist-style housing complex, designed in 1963 by Hungarian architect Ernő Goldfinger — included working-class East Londoners who’d lived there for decades, along with a more recent influx of Somali refugees, Pakistani and Bangladeshi migrants, and fellow artists seeking cheap housing. The band moved into the building in the fall of 2015 as part of an artist-residency program arranged by Bow Arts Trust, a London arts organization. Through a special “live/work” lease, they stayed in the building for eleven months, giving them time to write the material for their new album, Balfron Promise, which was released February 2 on UK label Cooking Vinyl. 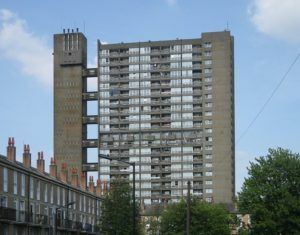 Goldfinger designed the Balfron Tower with the egalitarian vision of providing social housing for working class locals. Rising high in the London skyline, its imposing edifice and thoughtful design projected an image of socialist utopia. But after all these decades, the aging flats were in much need of repair. The elevators had become unreliable, posing a potential safety hazard for residents living on the upper floors of the 26-story structure. Upstairs in their living room, the band could see a very different scene playing out in the nearby Canary Wharf business district — a place of trendy cafes, high-end shops and shiny skyscrapers serving as headquarters for banking giants like Barclays and JP Morgan Chase. Over the year they lived in the tower, the creep of global capital seemed perpetually on the horizon. Indeed, 47Soul’s very presence in the building was a sign of London’s ongoing gentrification process. The live/work artist lease they’d secured was introduced as part of a wider plan from the building’s owner to move out longtime tenants, refurbish it, then resell it as luxury housing. For these four Palestinian musicians, who’d arrived not fully realizing the situation, the whole process brought up uncomfortable parallels between their own families’ displacement and exile as Palestinians. Even the name of the tower sounded strikingly similar to the Balfour Declaration, the British statement issued during World War I that promised a state to Jewish settlers in Palestine. These politics of movement play out brilliantly in Balfron Promise. The album powers forward with dabke rhythms, whirling synth riffs and thoughtful lyrics, sung in both Arabic and English. Tracks like “Ghazal” (Promised Outro) are perfect for the dancefloor. The album’s 12-minute finale is driven by drum machine handclaps and incandescent synths, the lyrics revolving around the image of a wandering gazelle. Yet the album never settles anywhere for too long. The grooves often take unexpected detours, traversing intense builds and breakdowns. Many of the songs have two titles, one in Arabic and another in English, and the lyrics resist easy translation — all four members trade off on verses that are filled with indelible images, double meanings and allusions to displacement and repression. If Balfron Promise is a dance album, it is one designed not just to get people moving but also to make the listener think critically about their place in the world. “It’s the struggle to express our cause to people going through similar things, and to people that are also endorsing the system in a way that they might not be conscious of, and if they were conscious then they might act differently,” Suleiman says. 47Soul got their start in Amman, Jordan, in 2013. Similar to other contemporary acts, like Egyptian mahraganat performer Islam Chipsy and Syrian musician Omar Souleyman, they’ve gained international recognition for the way they re-contextualize and repackage sounds of the street. Their most popular song is “Intro to Shamstep,” a dabke-rock anthem, the title of which is a nod to the band’s Shami heritage, the catchy synth hook and drum machine beat invoking the populist power of dabke dances from Palestine, Lebanon, Jordan and Syria. But while Chipsy and Souleyman both built their Western appeal on their shaabi credentials and rugged sounds, 47Soul — which in addition to Suleiman and Arnaout includes MC/producer Tareq Abu Kwaik and percussionist Walaa Sbeit — is more hip, political and worldly in nature. Sbeit is from Haifa, and in addition to 47Soul he’s also known for his work with the Arabic reggae group Ministry of Dub-Key. Suleiman, who grew up in Washington DC, developed his chops studying at Boston’s Berklee College of Music and fronting a neo-soul band in the US. Abu Kwaik and Arnaout are both veterans of the alternative music scene in Amman, Jordan, where they gained recognition for solo projects and as former members of the Radiohead-esque tarab rock band El Morabba3 and the psychedelic lounge/reggae group Autostrad, respectively. Arnaout says 47Soul grew directly out of the alternative music scene that has taken shape in the Arab region over the past decade. 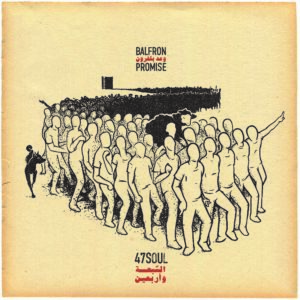 However, while his previous project spoke mostly to a young Arab audience, 47Soul has more global aspirations. Some purists view the band’s eclectic influences and appeal to foreign audiences with skepticism, but part of what makes 47Soul compelling is the way they navigate borders, languages and genres, sending out a political message while maintaining a sense of curious experimentation at the same time. Freedom of movement is a common theme in 47Soul’s work, in part because they’ve experienced a lack of it themselves. In 2014, the band moved from Jordan to the UK — where they currently live in the north London neighborhood of Tottenham — in large part because they’d grown fed up with the visa requirements and travel restrictions that had made it prohibitive for them to meet up in one place in the Middle East. In 2016, they had to cancel an American tour when the US Embassy rejected one of the band members’ visa applications. Last November, even more travel plans were thwarted when Egypt’s much-publicized Ashkal Festival—where the band was booked to play along with Tinariwen and Souad Massi — was suddenly canceled at the last minute. According to Arnaout, it’s been difficult for artists to get permits to perform in Egypt in the wake of the Mashrou Leila concert in Cairo Festival City last September, which led to a crackdown on Egypt’s LGBTQ community, after pictures circulated of fans at the show waving a rainbow pride flag. “We were set to have two concerts in Egypt last year and they were both canceled,” he says. 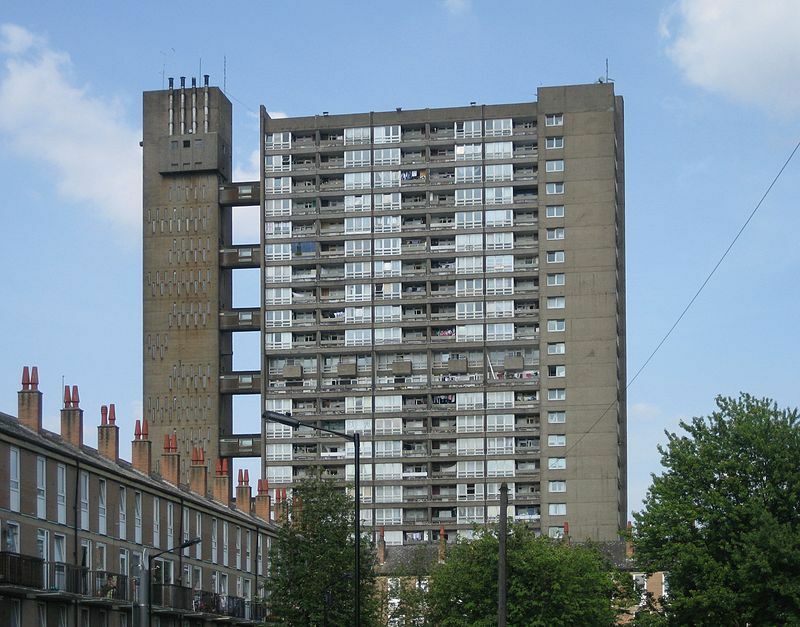 Even at the Balfron Tower, the band’s living situation was tenuous: According to the band’s manager, Fadi Haddadeen, part of their live/work lease agreement stipulated that they could be issued a 28-day notice to move out at any time during their stay. They ended up receiving the notice a few times, which they appealed and extended until finally moving out in August 2016. Indeed, the brutalism of the band’s surroundings shows through on tracks like album opener “Machina,” in which dramatic builds of guitar and synth evoke Vangelis’ score for the sci-fi film Blade Runner while the layered percussion and off-kilter drum machine rhythms keep the listener perpetually on edge. For a band that has gone through so much instability, it’s powerful to hear them settling into a sound of their own.